The U.S. and China may be starting a new Cold War, but it will be quite different from the last one. Some observers are now suggesting that the deepening confrontation between the United States and China marks the start of a new Cold War. The confrontation goes beyond trade issues to encompass security and high-tech hegemony. The antagonism between the two powers over the South China Sea is a conflict over current international norms and rules, and a choice of international maritime orders between one that is free and open based on law, and something very different. Meanwhile, the two countries are jostling for an edge in advanced technology, a new battleground in the power struggle to define the future world order. The current conflict between the U.S. and China is a struggle for the U.S., the dominant power, and China, the challenger, to expand their spheres of influence. This situation does indeed recall the divided world of the first Cold War, which finally ended about three decades ago. According to this line of reasoning, the fierce debate between Vice President Mike Pence and Premier Li Keqiang over the South China Sea at the East Asia Summit (EAS) and the failure to adopt a ministerial declaration at the Asia Pacific Economic Cooperation (APEC) Summit for the first time in history may suggest that a new Cold War is tearing apart the multilayered and multilateral regional architecture of the Asia-Pacific, built during the era of liberal internationalism after the Cold War. The confrontation between the U.S. and China may even make it impossible for countries in the region to meet the minimum requirements for keeping that architecture, namely a willingness to cooperate and move forward together, with disagreements over details. But if this is a new Cold War, it differs in important ways from the first one, which was based on antagonism between two distinct camps in the U.S. and the former Soviet Union. Today, the work is connected by economic and social interdependent networks, in an era of ever expanding globalization. Enormous and diverse exchange cross national borders amid the building of global value chains, flows of international capital, movements of people, including tourists and workers, the spread of traditional and pop culture as well as civil communication via the Internet. Economies and societies within sovereign states are closely connected to the outside world and influence one another. We no longer live in different worlds with different political and economic systems, partitioned by an iron curtain. Because many countries must respond to this reality, it is in their interests to avoid acting in a way that will escalate the divisiveness. Japan, the U.S. and Australia are trying to unify the direction of the Free and Open Indo-Pacific Strategy (FOIP) through joint infrastructure development projects. Meanwhile, Japan is looking to stabilize its relations with China through cooperation on infrastructure construction in third countries. India is also trying to carefully avoid conflict with China, even as it grows nervous about China’s growing influence in the Indian Ocean. ASEAN member countries, well aware of the danger of an excessive dependence on China and trying to avoid that risk, seek to balance China’s influence by strengthening U.S. and Japanese commitments, but they do accept assistance in infrastructure-construction and economic development as part of China’s Belt and Road Initiative. These countries’ strategy of not defining a rigid position is designed to protect their national interests and maintain diplomatic independence amid the tensions between the U.S. and China. They also recognize the reality that breaking up mutually dependent networks in an age of globalization and in a world dominated by a liberal world order entails significant risks and costs. Does the move to shut Huawei out of the next-generation communications business by the U.S. and other countries denote an attempt to build another iron curtain in a world dominated by globalization? The greatest difference between the last Cold War and today is the absence of an ideology to propagate. It appears that China intends to raise the degree of freedom for action by increasing its economic and political clout with the aim of building a new order, but we do not see any norms and values that will provide the foundation for a new world order for other countries to follow. 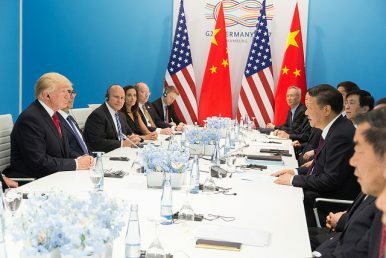 Under President Donald J. Trump, the U.S. is pursuing an America-first policy, stressing its own national interests and criticizing its allies, even as it tries to assemble a coalition to put pressure on China. Today, the U.S. faces its own serious internal divisions and is not what it used to be as a beacon of freedom and democracy or as a leader of a Western bloc with a vision for a new world order. This new Cold War, if that is what it is, involves an even more complicated structure of conflict and cooperation, division and unity than the last one. We have entered an age of extreme uncertainty.